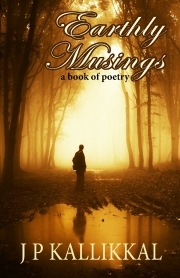 Earthly Musings is a collection of poems traversing over two decades of journey and change, starting with some of the poet’s early writings to recent ones. The poems delve into themes involving love, relationships, life and nature. The pristine beauty of Kerala aptly finds its reflection in the poetic muses of JP Kallikkal. Jaya Prakash is a deeply passionate and sentimental writer, and has an innate love for music, creative writing, theater, and arts. He graduated from the University of Delhi and has received a Diploma in Creative Writing in English and a Masters in Journalism and Mass Communication. He is versatile in many languages and primarily writes in English and Hindi.